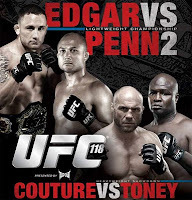 UFC 118 Edgar vs Penn 2 Preview | MMA Fighting Events Videos Techniques UFC Fight Picks and News. The last time BJ Penn stepped into the UFC octogan he lost. He lost, but he didn't get beat. BJ Penn had a bad day at the office, and Frankie Edgar had a great day. Even then, the fight went the distance and Frankie Edgar just barely pulled off the decision. BJ Penn will not have two bad days in the office in a row. He will be ready, motivated and will go get his belt back. It won't be easy though. I'm sure Frankie Edgar likes being the champ and is not ready to just hand it over. Another intriguing matchup for UFC 118 and MMA fans is Randy Couture vs. James Toney. I must admit I never thought this would happen, but it's here now and I'm excited to see what a UFC hall of famer can do to a hall of fame caliber boxer. Can Randy Couture clinch and get the fight to the ground before James Toney lands a knockout chingaso? We'll soon find out, but I see Couture winning this fight by using his world class wrestling, unescapable clinch, and either ground and pounding with a barrage of chingasos or a submission that Toney will just not be good enough on the ground to defend. Can James Toney Beat Randy Couture in UFC 118?